The largest vessel in the Foghorn Requiem armada, DFDS Seaways’ cruise ferry Princess Seaways operates on the DFDS Seaways’ Newcastle to Amsterdam route, sailing the 266 nautical miles each way 363 days of the year. Built in Germany in 1986 by Schichau Seebeckwerft Princess Seaways is 162 metres in length with a capacity of 1400 passengers and 600 cars. The ship also has four bars, four restaurants, two shops, a casino, cinema and Kids’ Club on board. DFDS Seaways is Northern Europe’s largest integrated shipping and logistics company, with a network of 30 routes and 50 freight and passenger ships. The Inshore Fisheries and Conservation Authorities “lead, champion and manage a sustainable marine environment and inshore ﬁsheries, by successfully securing the right balance between social, environmental and economic beneﬁts to ensure healthy seas, sustainable ﬁsheries and a viable industry”. Northumberland IFCA contributes to the Foghorn Requiem with the St. Oswald, a 21m steel mono-hulled patrol vessel built at the Hepworth Shipyard, Hull in 2001. The St. Oswald is used to carry out inspections at sea between its base at Royal Quays in the Tyne and Scotland. 24-hour lifeboat search and rescue service and seasonal lifeguard services across the UK including North-East bases at Tynemouth, Sunderland, Cullercoats, Blyth, Newbiggin, Berwick, Seahouses, Craster, Amble, Hartlepool, Redcar bases. The Tynemouth RNLI brings the RNLB Spirit of Northumberland to the Foghorn Requiem ﬂotilla, a Severn- class lifeboat and the largest in the RNLI ﬂeet. A Damon Multicat 1506 built by Mustang Marine in Wales for Port of Tyne, the Sir Bobby Robson was oﬃcially named in 2012 by the footballing legend’s widow and son, Lady Elsie Robson and Andrew Robson. A versatile vessel sometimes used as a plough, general workboat, tug or as dive support, the Sir Bobby Robson is also a specialist dredger that keeps the Tyne navigable by larger vessels, and is a unique addition to the Foghorn Requiem. North East Maritime Trust was formed to renew interest in traditional seagoing activities in the region, and its main emphasis is on the care, maintenance, restoration and reconstruction of wooden vessels. The Trust is participating in the Foghorn Requiem with six beautifully restored vessels, including the seine net fishing vessel Rachel Douglas was built in 1947 for Seahouses fishermen, later working from St Abbs until North East Maritime Trust members saved her for restoration in 2002. The vessel is restored to 1950s condition and is on the National Register of Historic Ships. One of the North East Maritime Trust’s smaller vessels, Royal Diadem II is a general purpose motor coble with auxiliary sail – a distinctive Northumbrian vessel. She was built by Harrison’s of Amble in 1948 for owners William and Albert Silk of Newton by the Sea. Later she worked from Craster, Boulmer, Blyth and South Shields before coming to the North East Maritime Trust in 2007. Another vessel owned by the North East Maritime Trust, the beautifully restored Sovereign was the UK’s oldest working fishing boat (in the over 10m category) when taken out of commission in February 2009. Built by Wilson Noble in Fraserburgh in 1936, during the war she was called up for naval service then subsequently fished out of Seahouses and then North Shields. She is a remarkable survival, being little altered in 72 years of hard work. She is now restored internally and externally to 1950s condition and is on the National Register of Historic Ships. James Cook, a 21 metre steel-hulled ketch, is operated by Ocean Youth Trust North, a charity that offers young people a safe but challenging environment in which to explore their identity and increase their confidence. Built in 1987 on the Tyne at the Hawthorn Leslie yard in Hebburn as a training project for unemployed young people at Hebburn side, James Cook is skippered by Grace Metcalfe, who was awarded ‘Young Sail Trainer of the Year’ in 2012. Through adventure under sail, often under adverse conditions, young people learn a variety of interpersonal and transferable skills that enable them to take control of their lives. Operated by Newcastle University the research vessel Princess Royal undertakes scientific and academic research. The university has been a partner in Foghorn Requiem since the beginning and has assisted with testing the shipshorns and specialist technology devised for the project. Based in Blyth, the RV Princess Royal is a 19m aluminium catamaran built by Blyth-based Alnmaritec and is skippered by Neil Armstrong who comes from several generations of fishermen. Throughout its history of more than 170 years, SVITZER has been at the forefront of specialised marine activities, providing harbour, coastal, offshore and ocean towage as well as salvage operations and standby- rescue services. With a diverse fleet of vessels SVITZER is a major maritime presence worldwide including both the Tyne and the Tees. SVITZER Marine brings the tug Redbridge to the Foghorn Requiem. Built in Hull in 1995 and 33m long, the Redbridge is capable of acting as a fire-fighting vessel. The second RNLI vessel participating in Foghorn Requiem is the RNLB Wolseley, based at the Sunderland RNLI. An Atlantic 85 class rib, the RNLB Wolseley will provide health and safety support to the Foghorn Requiem flotilla as well as representing an essential part of maritime life. The Inshore Fisheries Conservation Authority from the Humber to the Tyne (which includes Souter Lighthouse), North Eastern IFCA contributes to the Foghorn Requiem with the North Eastern Guardian III, a purpose built patrol and research vessel equipped for acoustic ground discrimination, sub-sea surveying and biological habitat assessment She will be travelling from the port of Whitby. Sarah is an ex RNLI Watson Class Lifeboat. built by Sussex S B Co., Shoreham, Yard No 105, in 1951. She was stationed at Lytham St. Annes from April 1951 until March 1978, where she took part in 78 service launches. She saved 35 lives at Lytham until she was transferred to the Relief Fleet where she worked between 1978-1982. Here she took part in 16 service launches and saved 8 lives. She was sold out of service in 1982, and is now used as an angling boat berthed at Royal Quays. Maritime Volunteer Service have over 400 members in more than 30 Units around the coasts and estuaries of the UK, and a range of craft used for training, emergency purposes and assistance at maritime events. MVS Northumbria brings their expertise and inflatable rib to the flotilla. The boats name Caer Urfa dates back to 400BC, (Celtic /Roman and translates Fortress of the Chieftains) it is also the name of the ‘first’ fort in South Shields before the existing Roman fort Arbiea was built on top of it. It is also the old name of South Shields. Caer Urfa was totally restored since purchased in 2006 and has passed many sea miles. She is sailed single handed by owner Mike Newby, who is also the archivist for the Colvic Watson Owners Group and the author of History of the Colvic Watson Motor Sailor. G L Watson & Co Ltd was the first naval yacht architects ‘in the world’ dating back to 1873. Hlin is an old wooden Folkboat, L 25ft B 7ft D 4ft. Hlin is also a Swedish pagan goddess of consolation, and protector of those whose lives are in danger. She was built in 1965 in Ipswich of Larch and Mahogany planks on Oak frames. The hull is black, with varnished wood mast and white sails (FB 256). Her owner Peter Mitchell is a Master Mariner, retired from teaching Master Mariners at South Tyneside College. Holly is a Seamaster 30 (9.8 m length, 3.5 m beam) built by Seamaster Boats of Dunmow, Essex, in 1981 (no longer in business). Holly is a displacement boat with twin 65 hp diesel engines - normal cruising speed is about 6 knots, top speed about 8 knots. She is built in GRP. She is based in Royal Quays Marina, North Shields. The Abernethy family bought her in September 2012 as a vessel primarily used on the river Thames. (featured on the cover of the River Thames map guide in 2010). The Abernethy family have spent the last three months bringing her equipment up to scratch for sea-going use once again. Trekkaway is a 28foot 6inch Colvic Watson motor sailer (Ketch) She was built in 1976 by the Colvic Watson boat building company. She is what the builders classed as a Mark 1, as most boats that followed her had a fibre glass super structure. She is now the only one of a hand full that had a wooden cabin and the only one that has that classic look. She spent all of her life on the river Dart (Dartmouth). She has appeared on TV in documentaries, one being Great Railway Journeys with Michael Portillo. The current owner purchased her in Dartmouth in 2010 and is currently in the process of restoring her back to her original looks. She is based in Royal Quays Marina in North Shields. Katrina is a Contessa 32, designed by David Sadler. Katrina was the first boat built in the JJ Taylor boat yard in Canada, made under licence from the great Jeremy Rogers in the UK. She is 32 ft long and is sloop rigged, and nearly 40 years old. She sails out of Royal Quays Marina in North Shields. Favourite was formerly a seine net fishing boat, built in 1947 by Walter Reekie at St Monance in Fife. During the 1950s and 60s she worked out of Seahouses , later moving to St Abbs, from which port members of the North East Maritime Trust purchased her for restoration. Favourite was restored in 2007 under the supervision of Tyneside’s last wooden boatbuilder Fred Crowell. The restoration has been done to 1950s standards with the minimum of modern equipment or techniques. She is on the National Register of Historic Ships. The Irene Patricia is a typical salmon coble of the middle twentieth century, she was built in the early1970s by Harrison’s of Amble for a fisherman working from Amble harbour. Her earlier name was Acclaim. At 26.5 feet in length she is ideal for salmon fishing and is smaller than the cobles used for more general purposes, though at one time there were many others of this size. During the 1980s Acclaim was sold to South Shields owner. After passing through several hands she was renamed Mary Young and eventually purchased and restored by a member of NEMT. She was again, recently renamed Irene Patricia in memory of the present owner’s late Wife. Peggy is a typical sailing and motoring Northumbrian coble, built by Harrisons of Amble in 1924, spending her early years working out of Beadnell and Seahouses for fisherman Robert Rutter. She later fished from Amble then Hartlepool before being saved for restoration under the wing of the North East Maritime Trust. She has been extensively restored with much work being undertaken by Fred Crowell in his workshop in South Shields and now takes part in maritime events on the North East coast. After 13 years scuba diving from a 6 Metre RIB Latin Lady a Princess 37 was purchased as a luxurious dive boat. Onboard side scanning technology provides 3D underwater imaging enabling pinpoint accuracy when locating suitable dive sites. Water access is achieved by a dedicated dive platform and boarding ladder; while post diving is further complemented by good food, hot showers and a spacious warm dry comfortable saloon. Sailing out of Royal Quays in North Shields, Nancy Tucket is one of about 400 Nantucket Clippers built in the '70s. They have travelled all over the world; one was sailed round it by a young couple and is now in a museum in Turkey. Nancy has two masts with the smaller one (the 'mizzen') aft of the rudder. This makes her a 'yawl' rather than a 'ketch' where the mizzen mast is further forward. Byker Belle is a 22ft coastal rowing skiff, which seats 5 rowers. Julieanne is a Sadler 26 built in 1983, sailing from Blyth Yacht Club. Red Seal Rescue in Tynemouth, provides rescue boats and crews for events on water, at sea or inland. Red Seals Rescue in Tynemouth will provide safety assistance and four inflatable ribs for the flotilla during the performance of Foghorn Requiem. Charlotte is a Contessa 32. 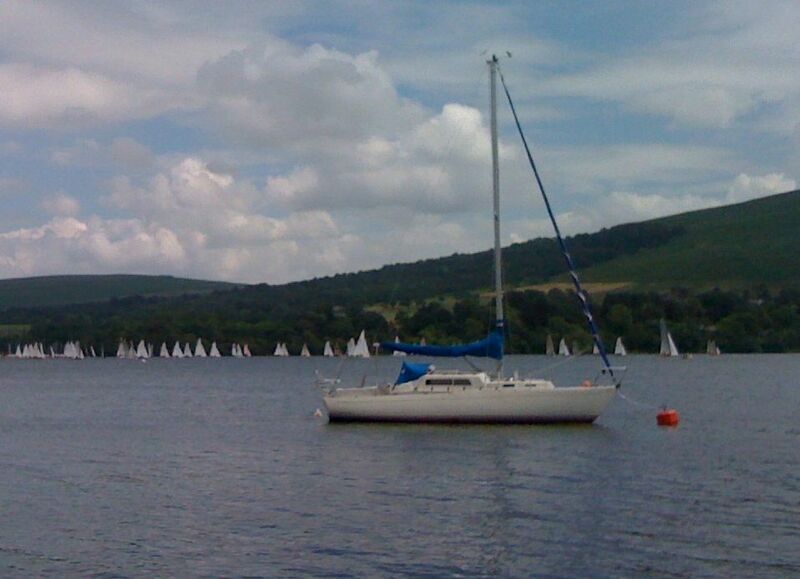 These boats are famous for their good sea keeping and sailing abilities. With over 750 hulls built, the yacht has become the most successful one-design cruiser-racer of all time. The Contessa 32 is seaworthy enough for offshore voyages in extreme weather conditions, but also performs well in races. A Contessa 32 was the only yacht in the small boat class to finish the disastrous 1979 Fastnet race, in which 15 lives were lost. The boats are still being built and refurbished by the Jeremy Rogers boatyard. 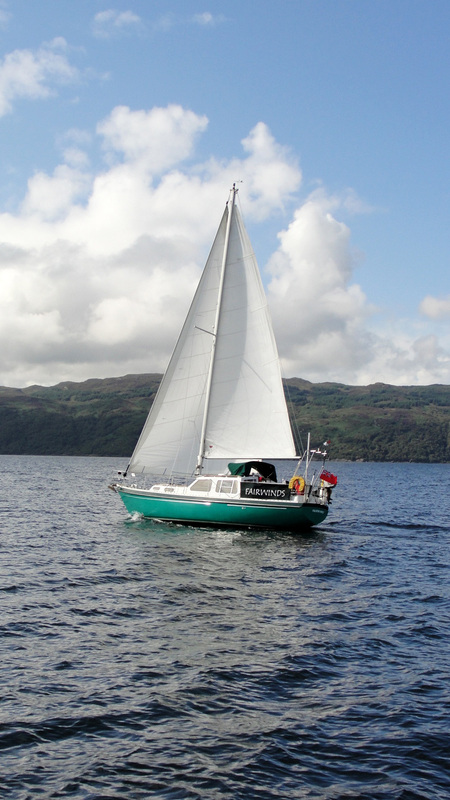 Charlotte is cruised extensively on the North East coast and has longer cruises to Holland, Shetland Orkneys, London and the south east coasts, she is shortly departing for the West Coast of Scotland via the Caledonian Canal. She is crewed by the Commodore of Sunderland Yacht club along with various friends and the trusty Sea dog “Charlie” the cocker Spaniel. The Marine Support & Training Service (MSTS) is a charity that provides training in Seamanship, Small Craft Engineering and Operational Support. MSTS will bring their expertise and an inflatable rib, the Blyth Venture, to the flotilla. Sailing out of Royal Quays in North Shields, the Nancy Tucket is one of about 400 Nantucket Clippers built in the '70s. They have travelled all over the world; one was sailed round it by a young couple and is now in a museum in Turkey. Nancy has two masts with the smaller one (the 'mizzen') aft of the rudder. This makes her a 'yawl' rather than a 'ketch' where the mizzen mast is further forward. Built 1960 by Dickies of Bangor, North Wales. Designed by John Bain, mahogany on oak, original teak deck and top sides. Original Gardner engines and gear boxes. A true gentleman's motor yacht! Lady Nicola is based in Royal Quays Marina in North Shields. Adventurer is a Beneteau Antares 620, used as a fishing vessels. She is based in St Peters Basin on The Tyne. "Our Frances' is a Northumbrian Fishing Coble built at Harrisons (Amble) around 1960, which has been lovingly restored by her owner, Harry Chamberlin. 'William D' is a day fishing vessel Day fishing vessel, based on the Tyne, which has been lovingly restored by owner. Waylander is one of the new Farr Yacht design Bavaria Cruiser 36’s (11m) built in Germany. Currently berthed at Royal Quays, North Shields. Brightblue Studio is an art/architecture studio, based in North Shields. Brightblue Studio will bring the Trident Marine Voyager, a long keel cruising yacht to the flotilla. The vessel "Humber Stag" was built by a company called island plastic's (IP) on the river Humber. The boat owner and his brother fitted the boat out, the cabin, wheel house and built the fly bridge. The boat was known to have brought 2 16th century cannons into beadnell harbour, Northumberland and also worked from Dundee down to Whitby as a drive boat but mainly round the tyne river to the farm islands. The rigging and dive platform was built by the owner for the purpose off diving and is at present working in a sunken vessel the "Santa Maria" with hopeful recovery in the near future before heading to the west coat of Scotland. Moondancer is a "Leisure 27", built in May 1979, she is 27 foot and was built with 6 berths. She is made of fibreglass and powered by 3 sails or a 10hp volvo penta inboard engine. She is moored at Friars Goose, Felling and came to the Tyne 3 years ago from Wicklow in Ireland. She spent her first 30 years crossing the sea from Ireland to Wales and Scotland and raced around Ireland. Nowadays, she does weekends up to Amble and last year 3 days up to Edinburgh. This summer, weather permitting, she will go down to Scarborough for a week. 'Aquarelle is a Contessa 26, the baby sister of the Contessa 32, and like them was designed by David Sadler. She was built by Jeremy Rogers in Lymington in 1972 and sails out of Royal Quays. Vagabond is a 27 foot long Albin Vega. The yacht's design, by Per Brohäll (1964), is similar in style to the Nordic folkboat. Made in Sweden in 1972, Vagabond's fibreglass hull is more resistant to the elements than many boats built after the oil crisis of 1973 due to its high oil content. Having cruised around the South coast of England and the Lake District (pictured here), Vagabond arrived in Blyth in 2012. Jorvic is a Moody 27. She is sailing from Blyth. Big Wednesday is a 7 metre sports fishing boat berthed at Royal Quays. Built by Arvor Boats she is named after the cult John Milius 1978 film of the same name, depicting the surfing lifestyle of the 60's. Soul Mate is a Four Winns 268 Vista motor cruiser commissioned and registered in 2001, Soul Mate is based at Royal Quays Marina.